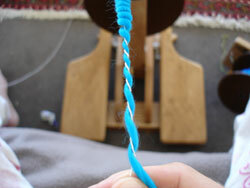 In order to spin Scarabée du Nil, you might use either a spindle or a spinning wheel with a large orifice and a sliding hook/ring if possible (it is a lot easier) or at least big hooks. 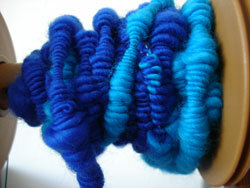 REQUIRED KNOWLEDGE : You need to know how to spin a slub yarn read here and learn more about worm yarns here. 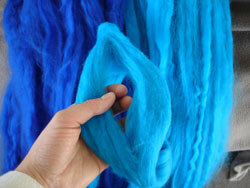 3 : a solid core yarn (not too slippery) preferably a commercial yarn. 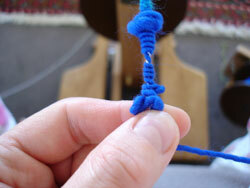 Break your top every 50 cm and then divide each bit lengthwise by en 4 (2cm thick). Place your prepared tops beside you. 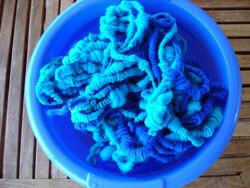 Spin a worsted a medium yarn, with average torsion. Alternate the 2 colors. 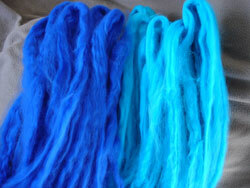 Here I have spun lapis and turquoise, one after another. 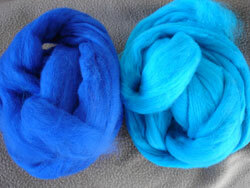 You can use a fine handspun in matching colors, spun in S. It must be very solid because it will be under a very high torsion. You can use either of these 2 methods (9 and 10 or 11 and 12). 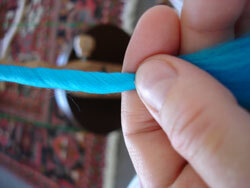 Here: you need to place the wrapping yarn at a 45° angle to the core. 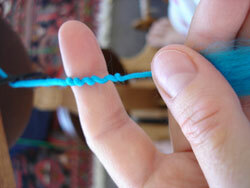 10 Then you put push very quickly and very often for the coils to be very tight. 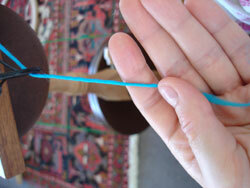 This is very important because the coils might move along the core and unwind themselves. 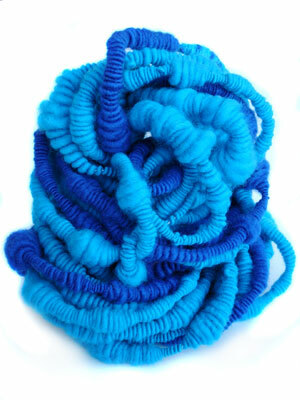 You ply as usual taking care of letting both yarn wind around each other in a balanced way. If necessary, you can pull a bit firmer on the core. 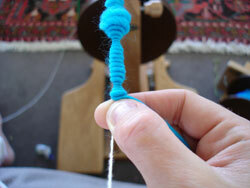 12 Then in a very quick motion you push the plied section forward to create the coil. 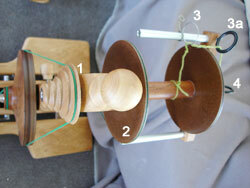 The ply/push motion must be a very very quick one: ply 5cm, push fast and firm, ply 5cm push etc. If you have a ply/push motion which is too low, while you take your time, the core will twist and twist until the point of breakage. 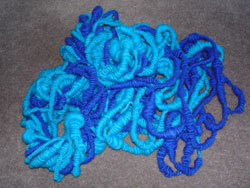 It is a quite inevitable problem especially at the beginning, it is quite annoying too but after a few km/miles of coiled yarns you will find a automatic movement to limit the core's torsion. 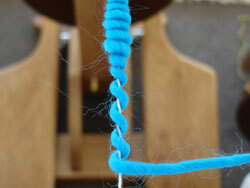 If you have that problem, I encourage you to use the second method (10 &11), letting the core and wrapping yarns winding around each other will absorb a part of the core's twist. 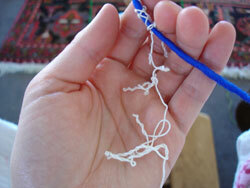 If you have spun an over twisted wrapping yarn, it will end up like the picture 15. 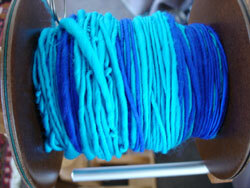 1- you use method 2 et let both yarns ply together in a balanced way and then push quickly. 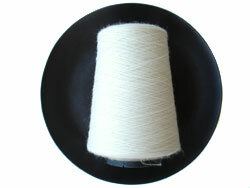 The bobbin fills up quickly with such yarns therefore it is always better to use a jumbo bobbin.